The Kindergarten class has been creating puzzles from poster board by drawing and coloring animal habitats on the front. They then draw the puzzle pieces on the back in order to create the puzzle. This project also dovetails nicely with the work the children are doing in math class with regard to shapes, counting, and using critical thinking skills. First grade just began studying Georges Seurat and Pointillism. Seurat believed that painters could use color to make harmony and emotion within art, just as musicians use counterpoint and variation to create musical harmony. In his work, he created different emotions through use of various hues, changes in color tone and vertical or horizontal lines — all depending on whether the art was meant to portray exhilaration, peace, or despair. Second-grade students are studying Henry Rousseau, who’s most well known for the jungle themes on which most of the pieces he created were based. Rousseau can serve as an inspiration to us all as he was not formally trained, but rather took up painting as a hobby. Students and staff alike have been enjoying the jungle display in the lower school corridor! Learning about the ancient Egyptians is a high point of a Westminster student’s studies, and the current third-grade students had the chance to create an Egyptian sarcophagus from clay. The pieces were then fired and painted. Students were also interested to learn about the various materials used in order to construct the sarcophagi, including stone, ceramic, and cedar. In like fashion, the fourth-grade students are immersed in ancient Greek culture and mythology in history and in art. Fourth graders sculpted Greek mythological figures from pottery and clay, which will also be fired and painted. Fifth-grade students have had a unique opportunity to serve the community by making handmade pottery bowls that will be donated to Empty Bowls. Empty Bowls is an annual event which “brings community together through art, a bowl of soup and the desire to help in the struggle against hunger. For just $25, guests enjoy “a meal of soup and bread, and take home handmade ceramic bowls created by local artists,” according to the Empty Bowls website (capitalareafoodbank.org). Mrs. Rose (WPC President) has helped to coordinate this effort. Thank you, Mrs. Rose! Keith Haring was a 1980s pop artist, and the sixth-grade students have studied him and his figural work. They also looked at his drawings, paintings, sculptures, and graffiti pieces. This inspired them to work on two figural works: one large-scale person and one small scale with tessellation included. 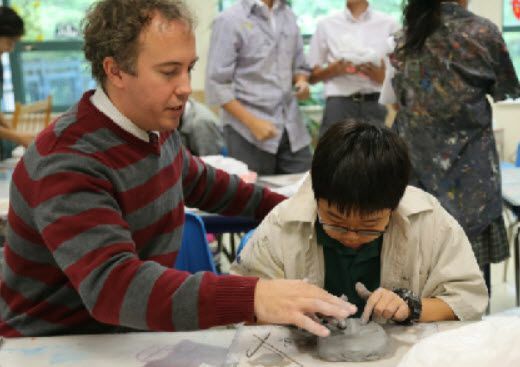 The eighth-grade students were excited to begin art classes this quarter. They have been studying Alexander Calder’s wire artwork while creating a self-portrait from various wires. You may have seen them displayed in the skylight corridor. They then moved on to drawing self-portraits, which has helped them focus on different types of shading.